This website is designed and maintained by a Whistler resident to let you know what the ‘real’ Whistler Blackcomb snow conditions are. Not only does it give you the official snow report, but you will be able to find out what kind of shape the mountains are in, from a ‘hands on’ perspective. I was born in Canada, near Toronto but moved to Brisbane, Australia when I was very young. 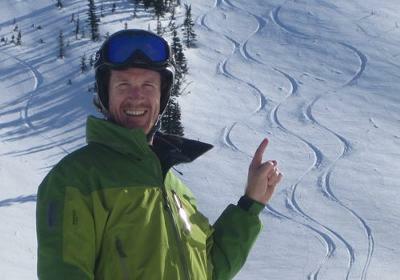 I came to Whistler in October 2003 with the intention of learning to ski, have a good time and then move on. Well 2 out 3 aint bad ! I have no affiliation with the Whistler Blackcomb Ski Resort, and report the skiing and snow conditions as I honestly find it. I have in the past worked for the mountain, and may from time to time hold ’seasonal’ or ‘volunteer’ jobs, but it will not persuade me to ‘talk up’ the conditions. If they are bad, I will say so, if they are good, I will say so. I am not an ‘expert’ skier, if you are looking for the snow conditions in order to ski the steepest lines or huck the highest cliffs, then I am not your best source of information. If however you are a competent skier who can ski almost any in-bound run in almost any conditions, then you are like me, and will get the most out of this report. I also try to describe how the overall mountain is, so that beginners can find out what the snow will be like in the areas they will be skiing the most.